I know I'm really late with my post about this beautiful collection, but the previous photos I took failed due to bad lighting and I had no shooting time in better lighting up until now.. As much as I love this season, I really hate how it gets dark so very early. My sincere apologies! 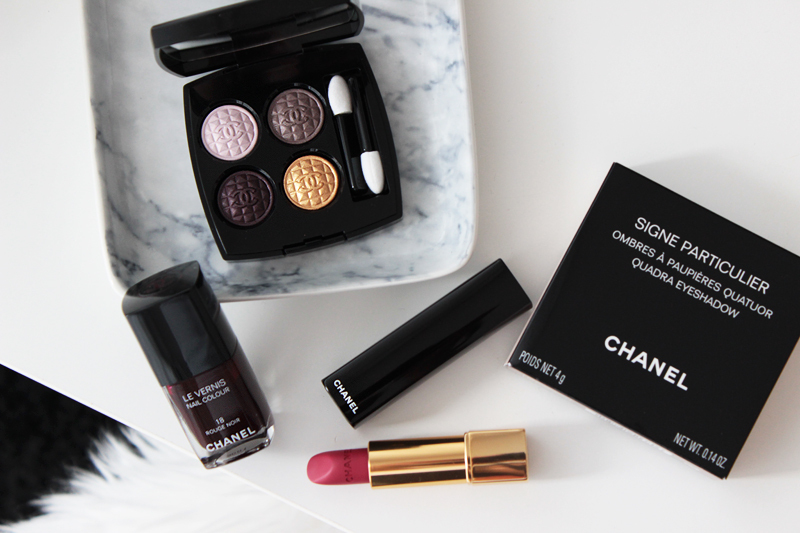 Chanel's Holiday collection for this year is a true beauty, focused on the iconic rich blackened red nail polish Rouge Noir which launched all the way back in 1994 on the Autumn/Winter ready-to-wear runway. I'm very fond of the idea of revisiting an iconic bestseller and taking it one step further: designing a full collection around it including products for lips, eyes and nails. It's amazing to see one bold, daring and iconic colour survive for over 20 years and keep on being a total hit! This special and iconic Holiday collection is definitely the perfect gift idea (or personal splurge) for anyone who loves deep, dark and rich burgundy/red hues with a bit of makeup history. Everybody's attention when checking out this collection is immediately drawn to the beautiful La Création Exclusive Signe Particulier eyeshadow quad. 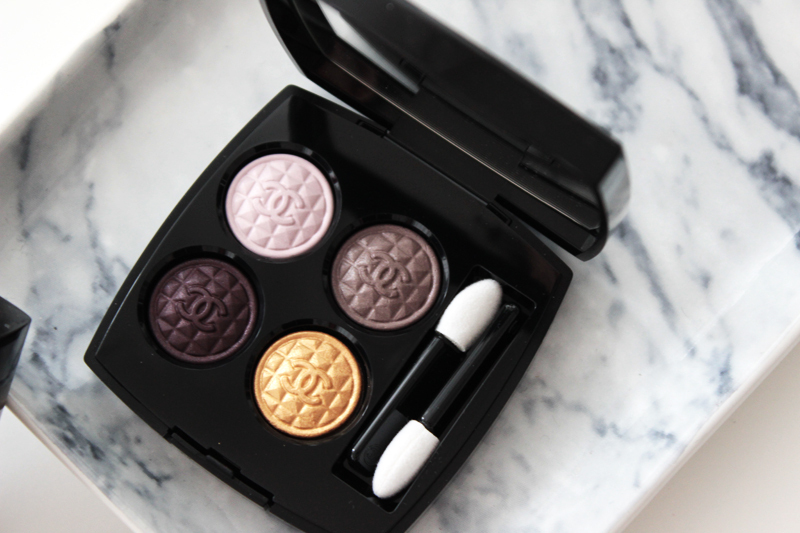 Taking the spirit from the Rouge Noir nail polish, this palette holds four beautiful eyeshadows that are perfect for the upcoming Christmas and New Year parties. The palette holds a deep burgundy "rouge noir" shade that adds intensity, a warm saffron gold I'd use on the lower lash line or as an eye catcher in the center of the eyelid, a soft light pink shade that highlights and a soft dusty rose/taupe type of shade that draws everything together. I find all four shades very nicely pigmented, although a little hard to blend together. The darkest two shades tend to overblend a little, so a cautious and not too keen hand is needed when applying these! I really like the soft pink as a highlight in the inner corners of my eyes, and the gold is a nice finishing touch that'll add some festive sparkle. I would definitely use a good long lasting eyeshadow base underneath these to bring out their vibrancy and get the most wearing time out of these. I reckon you won't be wearing a full on dark burgundy look all day long, but for evening wear along with a good base this'll hold through the evening perfectly. 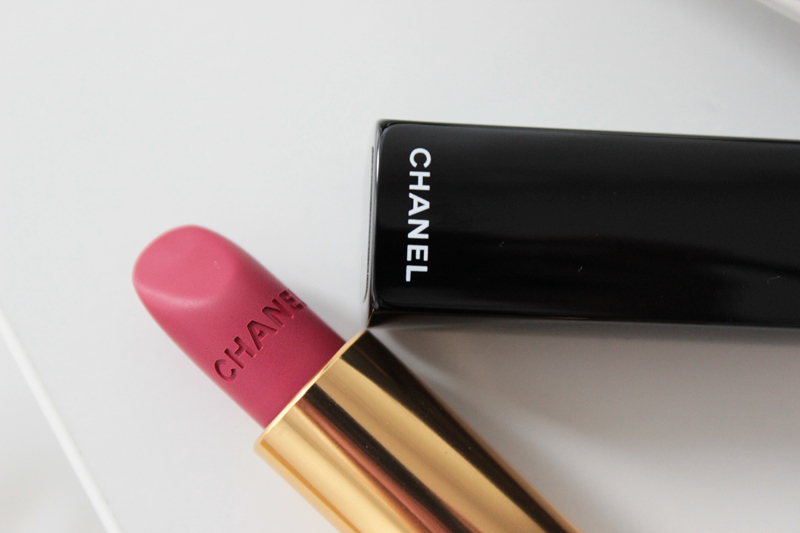 I also received the extremely beautiful Rouge Allure Velvet in the shade La Merveilleuse, a deep raspberry red. It's very bright and matte, but doesn't feel drying at all and goes on really smoothly and easily. The color is super opaque and stays beautiful for many hours - until food or a couple of drinks come along, of course. 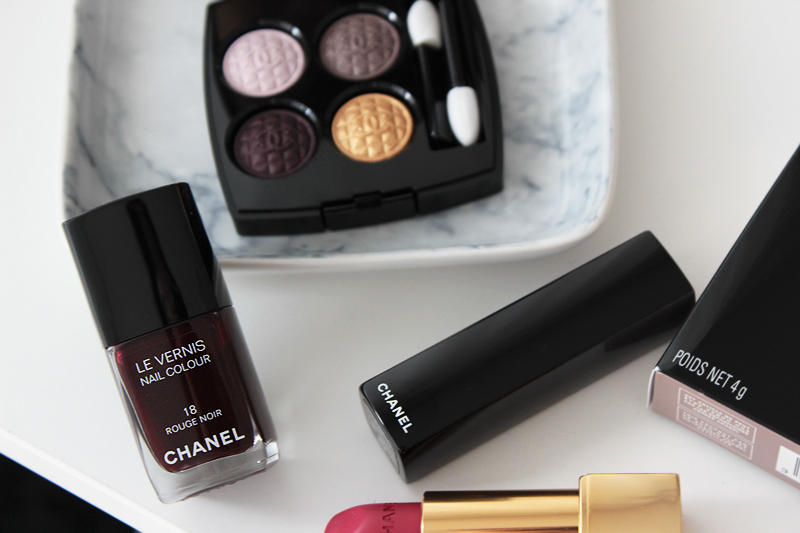 The true star and core of the collection is obviously Le Vernis in Rouge Noir which has an amazing formula that for some reason performs much better than other Chanel nail varnishes on my nails. You already read about it here: my mani lasted five days, a small miracle taking my weak nails into account! 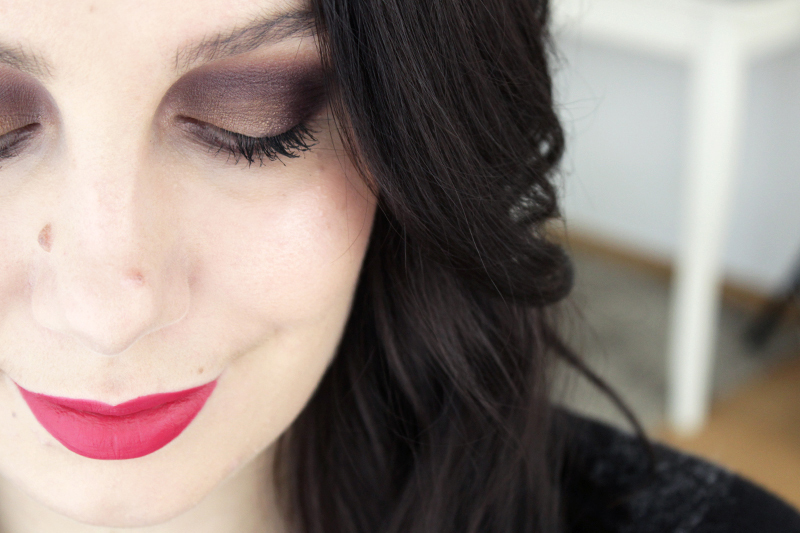 In this look I'm wearing the beautiful Rouge Allure Velvet in the shade La Merveilleuse on my lips and all shades of the Signe Particulier eyeshadow quad in Exclusive Creation on my eyes. I really like how both of these work together, even though they're quite powerful on their own already. If you're not fond of looks that are too strong, you can always go for either the hefty eye look on its own, or the bold statements lip on their own. 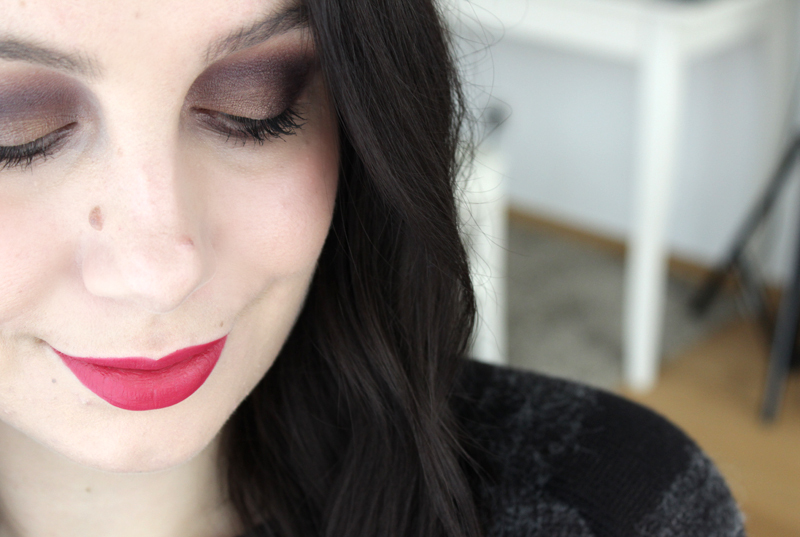 You can notice how the eyeshadows blended together very easily (a little too easily) - the look probably could've done with a little less blending even though I already refrained myself.. And just a little sidenote: I know I look a bit tired in these pictures, luckily I will be able to relax and catch up on some much needed sleep the following ten days. Yay for holidays! My personal favourites here? Definitely the lipstick and the nail polish, because both are of impeccable quality and would make the perfect gift without breaking the bank. If you're keen on this collection, don't hesitate for too long as all of these are limited edition and bound to sell out soon as they've been in stores since end October already.